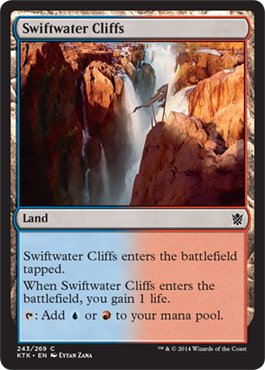 You need a lot of mana fixing in Khans of Tarkir limited, and that’s one of the reasons why Wizards printed these life lands. There are some people that say you should run each one you open up, but I beg to differ. I think you should just play the ones in your colors, and if you’re splashing for a 4th color then that’s fine. If you play all of the ones you open, you run the risk of not getting the correct mana when you need it. This is an easy choice for sealed players, but it gets more difficult in draft when you have to use it as one of your picks. 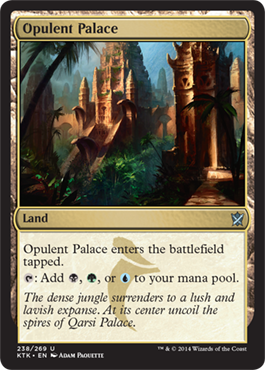 Just how important will these lands be? Do you want to first pick them? I’d say no. I think you should take these lands around pick 5 or 6 or later, after you have taken a multicolor card. Once you know what your second color is, it will be a lot easier to decide which one to take. I think you want to focus on drafting these more in packs 2 and 3, and get powerful cards for your pool in pack 1. There will be a lot of competition for these lands as people find their second and third colors in packs 2 and 3, so I would draft them highly then (but not overdraft them. 4 seems fine). The banners are in a different category than the Life Lands. These will probably all be drafted very late in packs 1 and 2, so you don’t have to choose them right away. During the pre-release in sealed, I found they were most useful when you couldn’t get good mana fixing with the lands you opened and when you had a heavy curve with a lot of 3-4 mana creatures. It’s also good when your pool is full of morph costs and you need various colors to cast it. I don’t think you need more than 1 in your sealed/draft pool, so don’t use multiples if they end up in your possession. In both sealed and draft, if your pool is full of 2 and 3 casting cost creatures I would probably skip the Banners altogether. Where they really come into play are in Abzan, Temur, and Sultai decks where players have lots of large green creatures. There will be times when you need them in Jeskai and Mardu, but it probably won’t be too often. In sealed, if they are in 2 of your colors I would probably play the tri-lands. The 3rd color will be a nice splashable color if you so desire. I think your chances of getting all 3 in your color are going to be rare though. In draft, you have a little bit of an easier time deciding whether to use them or not. It’s not something you want to draft highly in pack 1, but I think they will be high picks in packs 2 and especially 3. In pack 1 you’ll probably have 2 of your 3 colors chosen already, so if you can get this around pick 7 or later, take it. Even if it only ends up matching 2 of your 3 colors, I think it’s still pretty useful, and better than a junk/sideboard card that you would get around pick 8 or after. In packs 2 and 3, I could see these getting picked up as 3rd or 4th picks, and even higher if the rares aren’t in your color or worthless. There seems to be a nice balance between mono colored and multicolored cards in this set, so don’t feel like you need to overburden yourself with these if you can get a lot of them. I would definitely take them over the life lands in most cases. The only time I wouldn’t would be when the 3rd color splash doesn’t help while the life land is in your colors. I’ll now be going over the clan cards that I like at uncommon and common. All the fun cards are at rare of course, but there are still a large number of multicolor cards that can do some real damage at lower rarities. 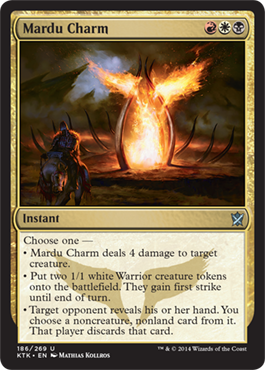 Ride Down is nice combat trick for Mardu, but I actually think it would be better in Jeskai. It’s a great way to push damage through. Mardu might have some bigger creatures, but Jeskai has Prowess which adds another power to the creature(s) when you use it. If you’re playing an aggressive Jeskai or Mardu deck, this would be decent removal. It makes those players that don’t protect their life totals pay the price. I can’t say I’d draft it highly in pack 1, but if my deck was shaping up to be either of the previously mentioned strategies, I’d take it highly in packs 2 and 3. Definitely playable in sealed as well. One card for 4 creatures with 5 power overall is pretty good, even if it is a common. It may seem like nothing, but in an aggressive Mardu deck, these tokens allow you to activate Raid abilities easily without give your opponent too much of a board advantage. The tokens are also great fodder for Butcher of the Horde. Being a 3 color card, I’m reluctant to take this highly in draft so I would hold off until I was at least solidly in 2 colors such as B/W or R/W. This means it could be after your 7th pick in pack one. If you do have at least 2 of the colors after pack 1 in draft, I would take this around my 4th pick in the next two packs. 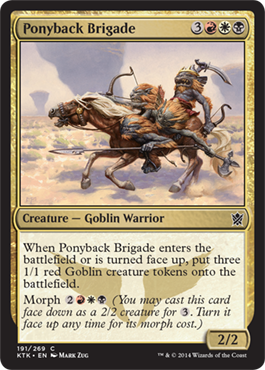 You still want to go for the more powerful mono colored cards if you can find them, but if there’s nothing else viable in those next two packs, then take Ponyback Brigade. 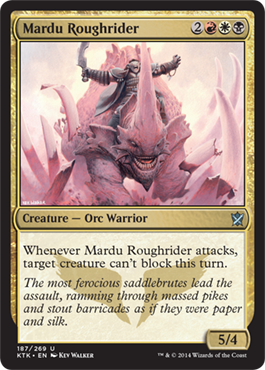 For the same cost of a morphed Ponyback Brigade, Mardu Roughrider gives you the same power and an added ability of stopping your opponent’s big blockers. These can be pretty rough on an opponent in multiples. Most of the red, white, and black mono colored cards that you’re going to be drafting in Mardu colors aren’t going to be that powerful. There will be some Outlast cards, some Raid cards, etc, but their power will probably be around 2 or 3. You’ll need a stronger finisher if you want to be able to go toe-to-toe with Abzan and Temur decks in a long game, so I would consider the Roughrider. I could consider taking him later in pack one, but in packs 2 and 3 I would take him earlier if you can swing Mardu. Pretty much all of the charms are powerful in Khans Limited, so I would draft them somewhat highly. I think they are worth taking even if you have to splash a 4th color in order to cast it. The first mode kills more than 70% of the creatures in the set, and the second one is raw card advantage (2 creatures for one card) as well as a combat trick. The third mode isn’t that great but in certain match ups it could be. 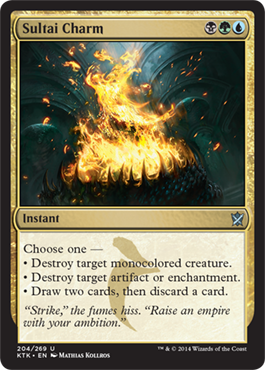 Sultai and Jeskai might be playing a few non-creature cards in the form of card draw, removal, or tempo, so you just might hit something. Just as with all disruption (such as Thoughtseize), it’s not so much about taking something useful as it is getting information about what your opponent is playing. That information can help you develop your strategy for the next few turns and come up with answers for their cards. 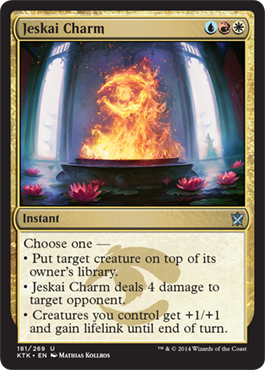 I think the most used ability of Jeskai Charm is going to be the last one. If you’re playing with a lot of blue and white flyers, or if you’re playing with a lot of creatures with Prowess, that ability can be back breaking. Jeskai Charm wants to be in an aggressive deck. The second ability is okay, but 3 mana for 4 damage isn’t great. The first ability is basically a worse Azorius Charm from RTR. I wouldn’t take this card as early as Mardu Charm, but if you can get your hands on a Jeskai Ascendancy or a lot of Prowess creatures, you MUST play with it. 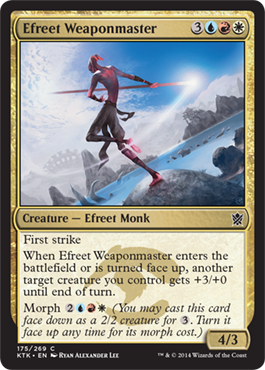 I could also see this splashed in an aggressive Mardu deck for the second and third modes. Not a high draft in any pack, but worth having if you’re in UW. It’s also pretty good in sealed. 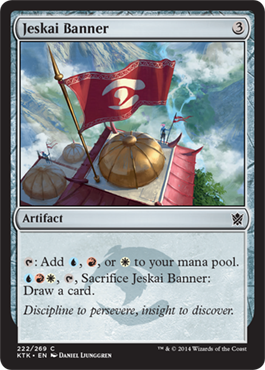 Jeskai has some pretty sweet flyers. What makes Highspire Mantis great is that he fits into Mardu decks easily as well. Flying AND trample make it great if you’re playing combat tricks. He’ll push damage through easily and there will be very few cards that can trade with it in the air. I would draft this card highly in my first back if my first 4-5 cards were either white or red. He’s definitely worth the splash if you don’t end up going with the other color in his casting cost. In packs 2 and 3, he might even be a first pick if he’s in your colors. If you morph him on turn 3, drop the Mantis on turn 4, then flip him on turn 5, your opponent will be looking at a lot of damage. 5 mana for a 4/3 first striker is decent, and I could see this being a high pick in pack 3 and possibly even pack 2 if you’re playing Jeskai. Any deck with some kind of evasion will benefit from having him. He’s a little bit of a harder sell in pack 1 though, but it depends on which colors you have by pick 7. I personally think you want to know your 2nd color before you even consider taking 3 color cards. Everybody has been saying this is the best charm of them all, and I agree. It’s perfect for the upcoming metagame. The first mode will kill a lot of cards in standard, but also a large number of creatures in limited as well. I definitely would love to have a 3 mana kill spell for a Wooly Loxodon. Aside from Suspension Field or the Banners, there aren’t many targets for the second mode in limited, but still nice to have in those rare instances. The last one fits perfectly with Sultai’s dredge strategy. It gives you card advantage while also letting you activating cards like Treasure Cruise more easily. I think both the first and last modes will be used 50/50 in limited. It’s a must play in sealed if you’re playing at least 2 of Sultai’s colors and worth a splash. As for draft, I would take this first in both my second and third packs, but would follow my rule of not taking it in pack 1 until I had 2 colors decided. If by pick 7 the second color seemed open, I would probably take it then. I just wouldn’t want to force myself into Sultai colors if I didn’t have to. While the Abomination isn’t the most efficient creatures out there, it fits perfectly in a Sultai deck. First, it has evasion (flying). Second, its toughness makes it hard to kill by a red spell. Third, it can be cheated out a turn earlier thanks to morph, which can also be a combat trick and finally you can draw and discard to dig to your win conditions and fill up your graveyard for various Delve spells. I consider him a 3rd to 4th pick in packs 2 and 3, and maybe after pick 8 in the first pack if I’ve chosen my second color at that point (otherwise, it’s good to hold off on him and just wait for him to come around in the next pack). Abomination of Gudul is a roleplayer for Sultai and does his job well. I played 2 in my pre-release sealed deck and used all of their abilities to their full extent. This guy has value written all over him. He’s a 2/2 flyer for starters which is very aggressive considering a card like Welking Tern is the same cost and has all sorts of restrictions. If you’re playing an aggressive Temur deck then you’ll probably want to play him on turn 2 most of the time. later in the game when you have a lot of mana open however, you can morph him for 3 then pack another 3 to bounce an attacker back to a player’s hand. This could save your creature from annihilation, or prevent an alpha strike that would surely kill you that turn. This is another card that’s worth picking up early in draft if you have strong first picks. 6 mana for his ability might seem like a lot, but in sealed it’s no problem at all. 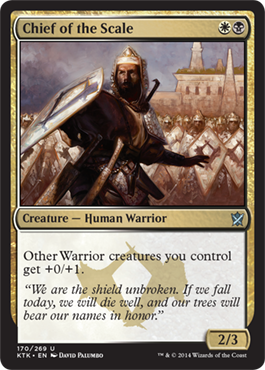 Temur didn’t seem to be all that great in the pre-release, but I think this could be an all-star in Sultai decks which proved themselves to be stronger than I originally thought. Another card that could go one of two ways. In a Jeskai deck it would be amazing. 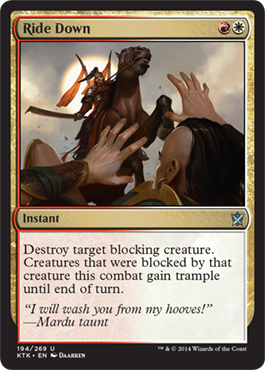 Tapping down their creature and/or killing it while activating your Prowess seems unfair to your opponent. The fact that you can chose both abilities more than makes up for it’s 3 casting cost. 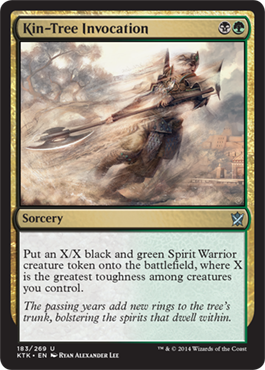 Temur would also benefit from having this card. Taking away their most powerful blocker that combat and/or blasting a chump blocker puts your opponent in the position of taking a good amount of damage or blocking with a creature they really wouldn’t want to block with. 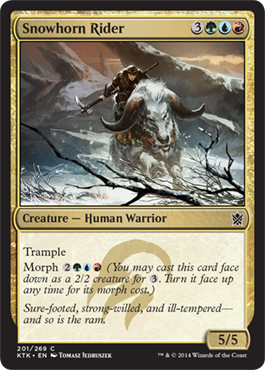 I find this ability to be pretty powerful in Khans limited, and the 2 damage is extremely relevant with all of the morph creatures being played. It’s also instant speed which means you can play it on defense as well. I like this card, and if I’m in either Temur or Jeskai I would take it highly in draft, maybe even as highly as my 4th choice. While you could probably find better spells in standard that do these 3 things, in limited I believe each mode here is pretty powerful. The one that sticks out the most is the Mana Leak ability. Sure Cancel does it better for the same converted mana cost (3), but it doesn’t have 2 other abilities you can use instead. I am always torn between whether or not I should play a counterspell or not in this format, but this makes that decision a lot easier. It’s first mode is also great. 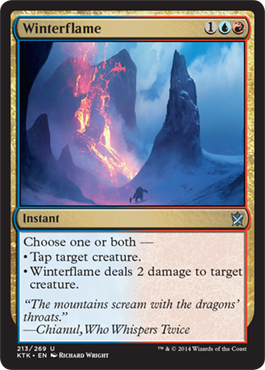 It doesn’t have the draw back of Savage Punch of not giving you the bonus if you don’t control a creature with 4 power, and if you’re playing Temur your creatures most definitely will be surviving whatever creature it fights with. The last mode comes into play later in the game. Most people like to attack with their beaters/finishers and leave back chump blockers in order to keep pressure on their opponent. Temur Charm’s 3rd ability basically takes those cards out of the equation and can set you up for an alpha strike if your opponent has nothing with high power to block with. I see this as a much better Gruul Charm. Must play in Temur sealed, high pick in packs 2 and 3 of draft. Snowhorn Rider is your typical finisher. It’s big, it has trample, and the mana cost isn’t too restrictive. Again, I really like the morph combat trick here. Attack as a 2/2, they block with a 2 power creature wanting to kill it, then you flip it and push 3 damage through. Must play in Temur sealed, maybe 5th-6th pick in packs 2 and 3 of draft. Possible to splash for it in another deck as well. I think the larger the cost, the easier it is to splash, especially with morph since you can still get value from it if you don’t draw the mana you need. 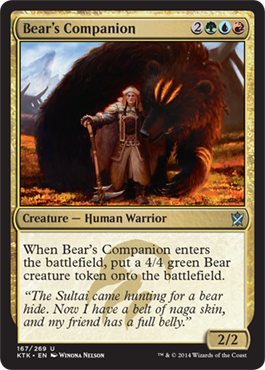 Bear’s Companion doesn’t have any neat morph abilities or anything like that, but getting 2 bodies from 1 card for 5 mana isn’t too bad. I splashed it in my Sultai deck at my first pre-release and got out more times than I thought it would. I also liked combo-ing it with Savage Punch then attacking for a lot of damage the following turn. Great in Temur decks, but easily splashed I think. Probably best splashed in a Sultai deck since you don’t really want to be playing slower creatures in Jeskai. These guys seem to work well together for some reason ^_^. Both work well in Mardu or Abzan decks (as you can see by the symbol on the cards) but for the sake of this article I’ll lump them in Abzan. Both have great casting costs, and if I learned anything from playing Abzan and playing against Mardu, it’s that the deck with the lower curve is going to win more often. The sealed format is slow which means that most players will playing quite a lot of 3 and 4 drop creatures. This is simply because colors outside of Mardu and Abzan don’t have a lot of decent 2 drops. Black actually has the largest concentration of warriors, but white and red have a few as well. If you’re drafting black heavily in your first pack, it’s a good idea to draft these guys. You’re bound to get some warriors if you stick in that color, and if you go Mardu you can get some more. 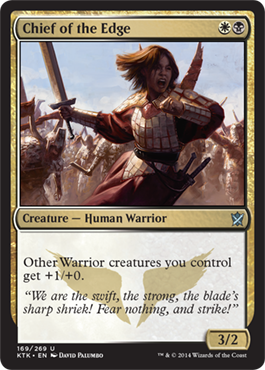 Abzan also has some warriors, so you can’t really go wrong either way. I would draft both of them rather high. If your first 4-5 cards were white or black, then you’ll be fine. The last card in my list for multicolor is Armament Corps. I like this card mainly because of it’s ability to pump your other cards up while still putting a threat on the table. I think 5 mana for a 4/4 that makes your other creatures bigger is worth it. It works best in decks that have a lot of Outlast creatures. 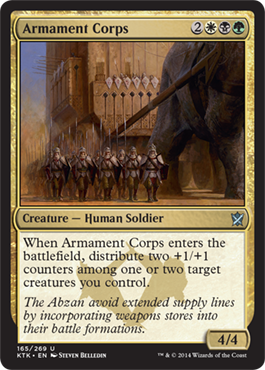 If you play one on turn 3 and turn 4, on turn 5 you can play Armament Corps and give both of those creatures (or any others of your choose) those Outlast abilities. 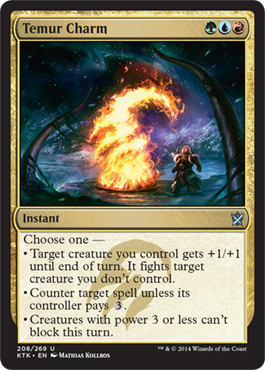 Just think – you play this and put a counter on your 5/5 creature and suddenly is has flying and first strike, or life link and death touch. Like I said, this is a good card for Abzan decks and I’d take it very highly in packs 2 and 3, especially if I could put together some good BW or GW outlast cards in the first pack. Abzan Guide – Good body, decent cost, life link. This is a good beater for Abzan decks. Death Frenzy – Fun sideboard card for decks using a lot of morph cards, but I think it’s also pretty good against Jeskai and Mardu decks that play a lot of 2 toughness creatures and tokens. Secret Plans – I guess this could be a good way to get card advantage in a draft deck with lots of morph cards. Khans of Tarkir goes on sale this Friday and I’m planning to draft the deck until my fingers bleed. I’m sure not all of my choices will end up panning out, but I think I should be able to make a 90% effective draft/sealed deck. Grand Prix Shizuoka will be Kahns of Tarkir sealed in January 2015, and I’ll be taking practice for it very seriously. I would like to thank you all for your patience and giving me the time to get all of these articles out and I hope that you got something useful from them or they at least reconfirmed what you were already thinking. If there were some synergies or combos I missed, it would be great to hear what you have to say. Feel free to leave any comments below. I’d like to invite you back in a few days for my Bang for your Buck articles to explore which cards I think will go up in Khans of Tarkir standard play, and which ones you should possibly sell. Until then, enjoy the first week of Khans standard and I hope you get some good cards from your draft! Thanks for all the content that you put out. I think I would pass out after writing 10% of what you do. I think a lot of the archetypes will be 2 colors plus a third for late game. Nearly all the early drops that aren’t Morphs in the third colour will be weak picks. 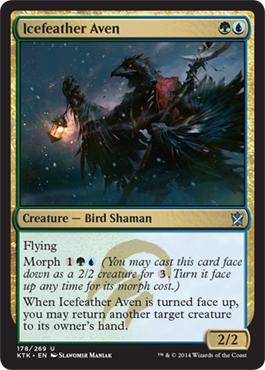 I can see Sultai BGu control only wanting the Aven for un morphing while GUr Timur often plays it at two. Meanwhile GRu Timur sees it as a late game tempo play…. Along with 4/5 color control variations and such there just seem so many possibilities at the moment. I think it’s going to be a fun format which takes a while to solve. Really appreciating these articles. Thank you.